Savlon Antiseptic Cream - General antiseptic healing for the whole family. White cream containing: Chlorhexidine Gluconate 0.1% w/w, Cetrimide 0.5% w/w. Cleansing and prevention of infection of all types of lesions, ranging from minor skin disorders or blisters, to minor burns and small wounds. 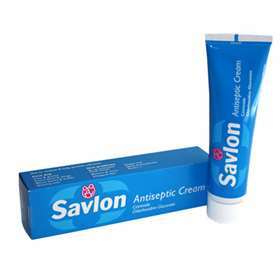 Savlon Antiseptic Cream is a family favourite for the first aid box. Use it to treat; Cuts and grazes, insect bites/stings, minor burns and scalds, shaving cuts. Savlon also helps ease skin problems, such as; Infected eczema, blisters, sores, chapped skin, nappy rash, spots and blackheads, sunburn. Savlon soothes and helps to prevent infection. It helps to heal the skin quickly and keeps the skin moisturised. (For adults and children) With clean hands gently apply cream over affected area as required. Seek medical advise if symptoms persist. Cetrimide 0.5%, Chlorhexidine Gluconate 0.1% w/w, Cetostearyl Alcohol, Liquid Pariffin, Methylhydroxybenzoate, Propylhydroxybenzoate, Perfume, Purified Water.